Sole Mate: a gorgeous deep red wine colour that is perfect for getting that vampy look in the colder months. There's no way you don't feel a bit of a siren when you put this on! Meet Me at Sunset: A dazzling bright orange that I swear by in the warmer months. The formula is admittedly very thin, or at least my bottle is, which really irritates me when applying but the colour more than pays off for it. I dare you not to feel happy and summery when you put this on. This is quite close to Chanel's Holiday nail polish, so why spend £18 when you only need to spend £8? Lapis of Lazuli: Now, I could easily substitute this one with Saltwater Happy which I wrote a rave review of here, or you could choose the very popular Bikini So Teeny. I think a cornflower or pastel blue is a staple, because it will look perfect in spring and summer, adding a bit of colour without being overly bright. Exactly which blue out of these three you want will depend on your preference of colour tone. Sand Tropez: I was very close to choosing Master Plan, but this one sneaked in and stole my heart instead. This is a very new addition to my collection, and I'm already in love with it. A gorgeous grey-toned beige, this is such a sophisticated looking colour that is a dream to apply. Honestly, what took me so long to buy it? After School Blazer: Last but not least, this wonderfully rich and dark navy blue, another one I love cracking out in the darker months. It looks wonderful with some glitter layered on top too! This is a great one to have for someone who is a little afraid of wearing a pure black nail varnish, but is looking for the same effect. So this is my Essie starter kit narrowed down to 5. If I hadn't been very strict with myself, I'm sure I would have ended up with a lot more (or just all of them) in this list, I just adore their colours. 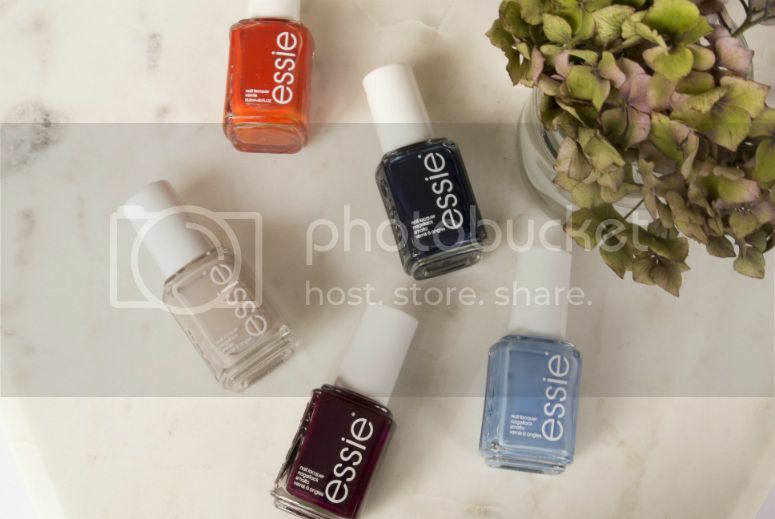 Are you an Essie fan too? Which colours would you have in your starter kit?